Istvan drove Anna, Emma, and me to St. Jean. We had our passports stamped and I made the decision to I start my Camino a day early. The wonderful man in the office helped me change my reservations and off I went. St Jean is a lovely town. What a beautiful walk uphill to Hunto. I relaxed at Hunto on the front porch and greeted the people who where walking past there. My roommate, Adriana gave me a gourd to hang from my pack. It is a symbol of the Camino. This is my room in Hunto. Dinner was with two French couples with just one person to do any interpreting. It was great fun. My plan was to go just a few kilometers the next day to Orrison, but I was convinced by Claire ( the one who was interpreting) to go all the way because of the weather forecast. So in the morning I walked all the way to Roncesvallles. I made it over the Pyrenees by the day I was going to start walking. Buen Camino! bells on the cows and sheep. The trail was pretty steep both going up and going down. As hard as it was, I loved doing it. Eating buttered bread and my dried fruit and nuts for lunch with Antonia looking off at the spectacular view was delightful. It was a fabulous walk. I met a young woman who was walking barefoot carrying her flip-flops. I asked her if she was planning to walk the whole way barefoot and she said she would walk as much as she could that way. I walked up the the statue of the Virgin. I thought I was almost there by this time but we had a long way to go. Finding water fountains was a relief. One of my favorite sound of the day was listening to the Spanish young men sining songs as they hiked. In Roncesvalles I stayed in the Monastery Alberques. I stayed on the third floor where we only had 2 beds in each cubical. Other floors had 2 bunk beds in each one. There were over 50 people on my floor. We shared bathrooms. I met Deborah, a woman from Australia, who walked by Hunto when I was relaxing in the front of the alberque. We walked together today. After about 3km, she realized that she had left a bag with her phone and credit card in Roncesvalles. So I walked back with her to find it. When we got back to Roncesvalles, we met a woman, Lydia, from France who was walking with her dog. 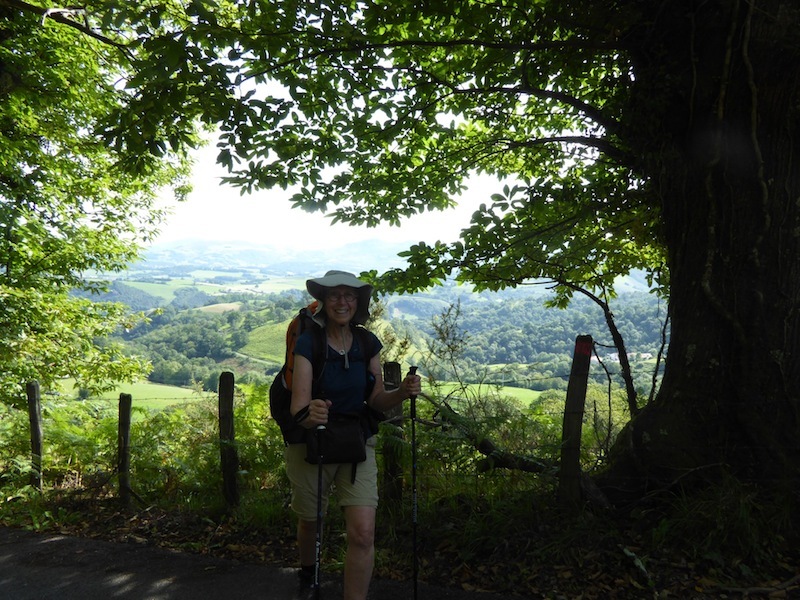 The best part is that she had just completed the Camino La Puy across France and was on her way to Camino de Santiago. Her dog loved to swim in the streams we crossed. We walked to Viscarret together (about 19km with our extra trip back). We were always happy to find water along the way. We stayed at Corizan Puno, the place I stayed the first night. Again a fabulous dinner with great conversation. (A couple from Korea; Marlin, a man from Houston; and Mary from Phoenix. There is another woman here who gave us those neck scarves with beads in them to keep us cool on hot days. Oh, the extra surprise is that I called Leonardo and he found my clip-on sun glasses. He mailed them today to Estella, but they won’t arrive until Tuesday so I may have to wait there for them. Categories: Camino Frances 2014 | Tags: Camino Frances 2014, Camino with a dog, El Camino, Hunto, life change, sharing, Spain, spiritual, stories, walking, Walking barefoot on Camino | Permalink. Nancy it sounds wonderful and you are having a great time meeting people. Glad to hear all is well and that you got one of those necklaces. It is still very hot here, 90 degrees today and has been for several days. Cooling for Labor Day weekend. All is well here. Wonderful – we are with you! Your words make me smile! So happy to hear it is going so well. I laughed out loud at the part where you walked back to retrieve Deborah’s bag! Couldn’t help but think of the Passport! HaHa. I’m glad you are getting your sunglasses back!! I hope your journey continues to be a great one. Thank you for the updates! I love you!! I was in the Pyrenees many years ago hiking, and loved the experience as well. I was on the Spanish side for hiking, then went to San Sebastian, which I don’t think is on the Camino. How I loved that area – the sounds especially. Sounds as though you are doing well, and meeting many interesting people. That is the important thing, not sending photos all along the way. We can all see them upon your return. On the plane last night, I watched a movie “Track”, I think was the name. It was about a young woman who hijked from Alice Springs (the very center of Australia) to the Indian Ocean. She was in many of the parts of Australia we visited, and it was an interesting story. She traveled with three adult camels, one baby camel, and her dog. For a time, an Aboriginal man walked with her, then she was alone which was most of the way. Guess there are lots of people like us that have interesting quests, as it was a true story. Our quest was driving the Gibb River Road, whcih was about a 680 kilometer unpaved road. It was not just unpaved, it was rutted, deep with dust at times, and other times full of sharp rocks, sometimes large ones. There were also river crossings without bridges…..what an interesting journey I had.